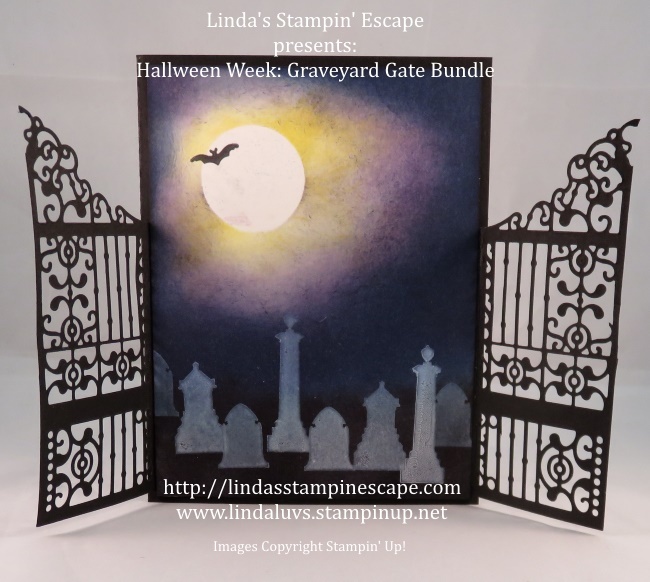 Halloween Week: Meet me at the Gate! Today is my last post for “Halloween Week” … and I’ve saved the best for last! 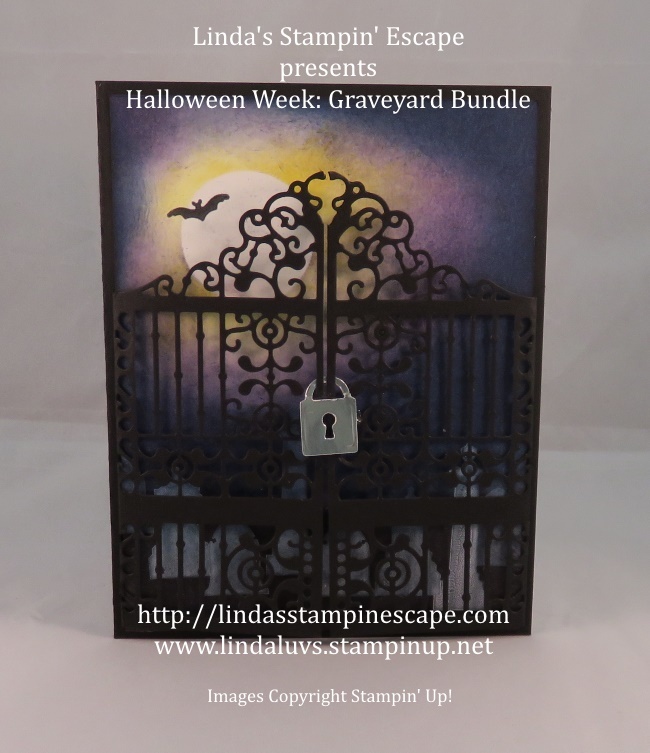 I’m using the Graveyard Gate bundle and this gate is extraordinary! I love it!! Make sure you keep following my posts, because you will see this gorgeous gate many more times!! I started by cutting my gate with the help of the Precision Base plate and the Die Brush … makes creating this detailed gate much easier. Once the gate closes … you must lock it, and that is done with the dies that are included in the bundle. Next, I worked on my background. I began with Whisper White paper and a 1-1/4″ circle punch and used it as a mask for my moon. I sponged Daffodil Delight around the moon, then Elegant Eggplant, and Night of Navy after that. When I removed my mask, a bright white moon showed above! I dabbed the sponge over the moon just a bit to make it look more realistic. 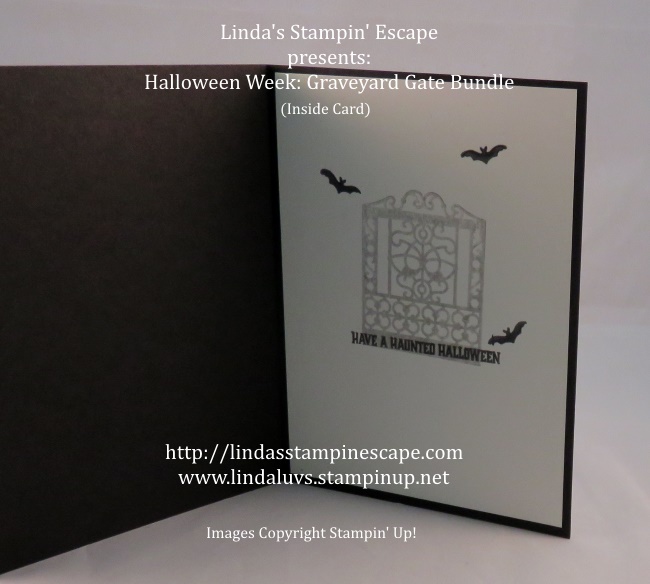 I then sponged the bottom of the card with the Archival Black ink… I did not wait till it was fully dry, I stamped my gravestones over the top using Craft Whisper White! The white picked up some of the colors from the other inks and created an aged gravestone … so cool! Here is a sneak peek at the inside… all done with one ink pad, just stamping off the ink on the gate so it looks lighter. This entire bundle is so much fun, and don’t think that it’s only for Halloween. Make sure you follow my blog because I will be sharing more ideas from this great bundle. There’s only 1 more month to Halloween so I shared the list of ingredients that I used to create this card. Thanks so much for walking through the graveyard with me. I hope you enjoyed the techniques I used to create this card. Great card LInda! And I’m not a Halloween fan! Wow….absolutely gorgeous card!!! I love it!